Asphalt shingle installation by Rhode Island roofing contractor. A new roof will not only protect you and your family from the elements, but it will also add to the overall appearance and value of your home. A roof should be viewed as an investment – a cheaply done roof will only cause you to spend more money in the long run. That is why at Roofing Doctor we are committed to providing the best service, as well as, good information and advice that will meet your needs as our customer. Re-roofing is such an important investment. We promise to provide the best possible service when it comes to Surface Preparation, Installation of a New Roof, and Clean-Up. Roof Deck is Ready for Underlayment and Shingles. Roof Being Stripped of the old Roofing Material. Necessary permits are obtained by us including building, historical society, and coastal permits. We do not use dumpsters because they can often damage your property. Instead, we have light dump trucks which are mobile, cleaner, and more efficient. 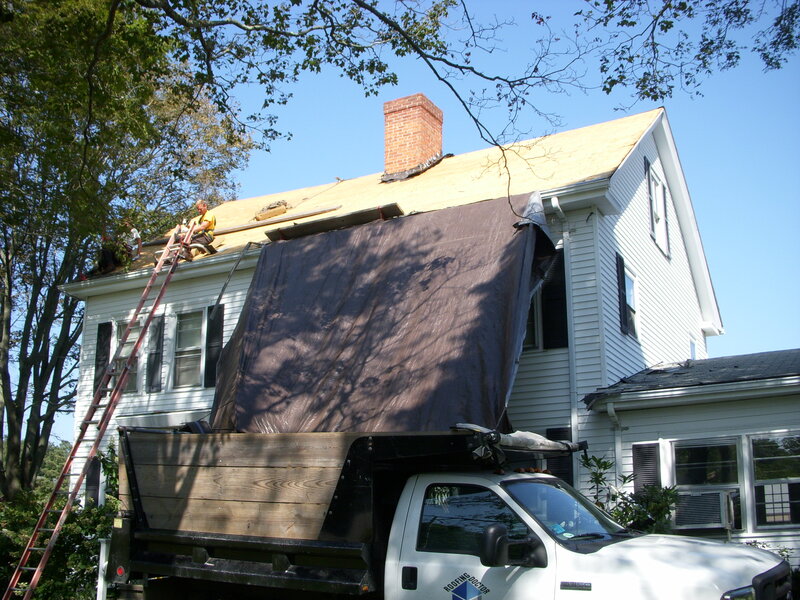 Old shingles, underlayment, drip edges, and compromised flashings are carefully and completely removed. The roof deck is carefully inspected. Loose boards or sheathings are re-nailed. If rotted wood is found, it is repaired or replaced. Since ice and water barriers are crucially important, we always install them in critical areas such as six feet above the gutter, in valleys, and around chimneys and skylights. We install RoofRunner and DiamondDeck synthetic underlayment. In order to eliminate water run-off to fascia and siding, we always install aluminum or copper drip-edge. If this step is skipped, the water will damage the paint and eventually cause fascia and siding to rot. We install new flashings if necessary and always change all pipe vent boots. We can also replace chimney flashings if necessary. We strongly recommend installing a ridge vent for every house. We want to leave our customers happy and hassle-free. That is why we take clean-up very seriously. Clean-up is performed daily and thoroughly. We remove all rubbish and supplies from the site. Our mission is to leave your home and yard perfectly clean and looking better then it did before we started the job! We are happy to offer emergency repair services and repair leaking roofs as soon as possible. Most of the time, we are able to respond within 24 hours and cover the affected area with tarps. This will ensure that your home is protected until the roof is repaired. We are Authorized Installers of brands like a GAF & CertainTeed, and are certified as a SELECT ShingleMaster™ by CertainTeed, who states: "This is the top level CertainTeed roofing credential, and represents the highest standards of excellence, quality and knowledge in the shingle roofing industry." In addition to the standard manufacturer’s product warranty, Roofing Doctor also offers a 10 year warranty on all work performed. We will perform any necessary repairs at no labor cost to you!